Why is my V7.ii air box knee deep in oil and the rubber bulb thingy gunged up? It's clean oil, no mayo. What are the clear plastic bulbs for? Are they drain plugs? There appear to be three. Are there more? What do they do? Is there a foam sponge inside? It is probably full of oil now. How does one retrieve it and get the oil out of it without dismantling half the bike? There appears to be absolutely no information on this system in the service manual. What it is? What it does? How it works? How to get it apart and service/clean it? If you have that much oil in the air box then you are probably overfilling the sump. There should be a drain tube for the air box with a plug in it. I did not myself change the oil, that was the dealer before I took the bike. There was enough oil to soak a few kitchen towels drying it out. It was clean fresh oil so I doubt it has been there long. The exhausts are not smoking so I presume it was overfilled too. There is a clearish plastic 'bulb' below the air box inside the panel. Is that the bung of which you speak? I've cleaned the bulb. Oil came out of the drain. When I probed the drain tube with a cotton bud there was a soft obstruction inside, is this foam? That foam must be soaked in oil now, how does one clean that up? I cannot find an exit hole in the floor of the air box so how does this oil get out to the drain? 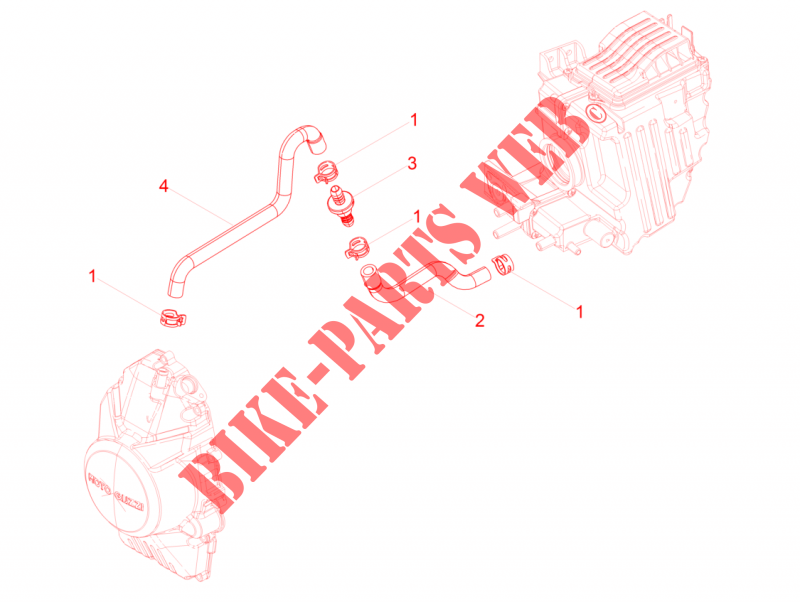 Where does the engine breather come into the air box? Where does the oil get into the air box? What are the other two bulbs for? Ventilation of engine is brought from the valve covers up to the middle of the frame pipe. In upper part of frame pipe a hose is connected which is drawn to the air box. Small amount of oil in the bottom of the box can be found. This small amount of oil is probably considered to be drawn into the engine again. 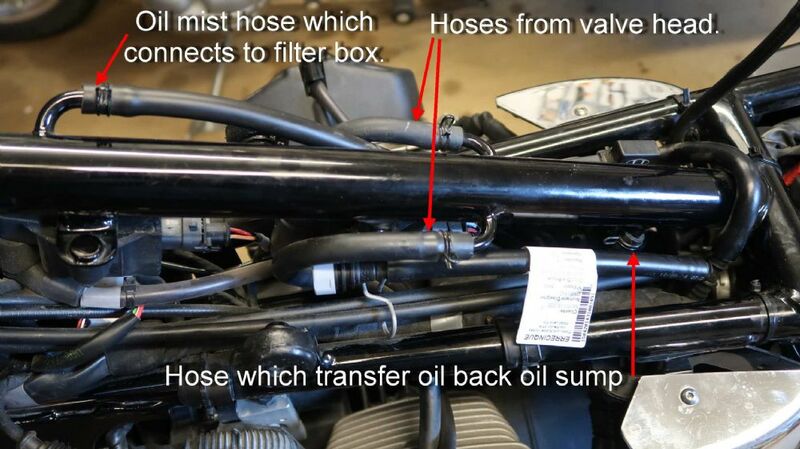 In the lower part of the frame pipe condensed oil is drained and brought to the oil sump. This will sometimes results in water in the oil sump. Plastic bulbs in the air box is used for closing connections which were used in earlier models. Include a picture of ventilation hoses below the fuel tank. ...and as I discovered when poking around a new V7 III, the 2 spare inlets to the airbox are now used. I imagine one of them might be to do with fuel tank ventilation. I found the system myself. It is a different system which can not be done on my V7 II. Pressure below pistons is released by a ny connection. What is item 3 in that drawing? A one way valve by any chance? With the oil mopped out and the 'bung' off to drain the rest out it seems to have removed or at least lessened the hunting at idle when cold and the annoying dotting out when the throttle was lifted when cold. I don't think it's my imagination but I'm at a loss to explain how draining the breather system might affect cold idling as it could not cause enough pressure to bother the engine, unless oil was going into the intake (but no oil smoke from exhaust). I have known an air filter to get clogged with oil when that happens. Guzzis don't like their sumps overfilled, they dump the excess into the air box. But each bike seems to have it's own preferred oil level, so to some extent you have to work out that level siuts your bike, but often halfway between top and bottom marks on the dipstick works well. The Enfield (EFI-500 Classic) is exactly the same, the correct level is between the marks not at the maximum level, and if overfilled spews oil into the air box. However its sight glass design is such that it never shows the same level twice. However the V7 handbook says the oil level has to be checked after a run, which is not very convenient if you want to check the oil before a run. I have fitted the H&B centre stand which is a great aid to me generally and a lot easier than using the bike jack, especially with hot exhaust pipes. I would like to understand the internal plumbing of the filter box breather system, I do not understand how oil is getting into the air filter chamber proper, I cannot see any holes; it was really only a pool of oil covering the floor of the chamber. I cannot see where it comes in, nor how it is supposed to drain out. If there is foam in the lower chamber than it must be soaked in oil now. Why put foam there, it will just turn into a sticky mess and get blocked up. There are three drain plugs or bulbs, the one at the side (under the cover by the lock) has let oil out, the other two are dry. I do not understand the internal plumbing of this box. It comes in via the breather pipe at the front of the airbox, through a foam filter. The drain is a clear blanking plug on the front left corner of the airbox. Another version of the same drawing (2015 V7ii) shows a hose at (15) instead of a cap. Is it possible the no-return valve has failed? Drawings for earlier versions of the V7 (ca.2012) show extra plumbing with all the spigots used for hoses. The engine intake is a very effective vacuum pump. It's drawing 9.3 litres every second at 1500rpm, that's a lot. If the foam has clogged up then gasses from the breather cannot escape and as there is no bleed on the plumbing, the engine is going to draw oil up from the crankcase into the air box. Simple engineering just looking at it.